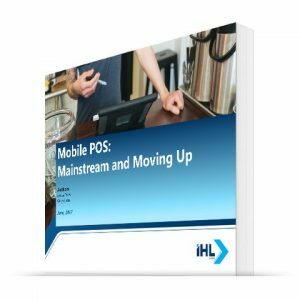 Mobile POS Software is one of the fastest growing areas in retail technology, but it is not growing at the same speed in all retail segments or even by the size of retailers. 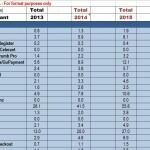 This research tracks the installs and shipments of software licenses in Mobile POS instances. It reviews the smaller retailers “mom and pop’s” that began the mobile POS trend and that are seeing tremendous technology disruption for traditional POS terminals. It also covers the forecast for the the fast rise in adoption of mPOS in the enterprise retailers. You would use this research to answer the following questions? How big is this market? How fast is it growing? 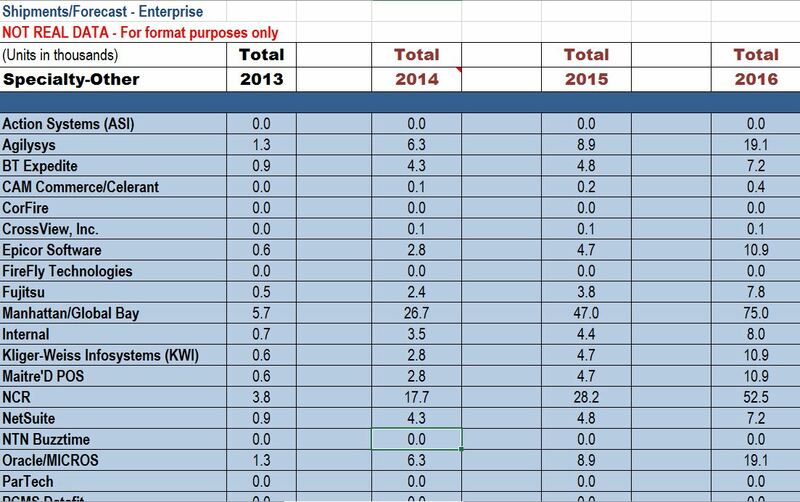 Which vendors are winning? How much share does Square, Level Up, Shopkeep have? 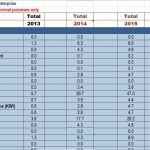 Are these vendors doing better than Enterprise vendors like Oracle, Toshiba and Starmount? How does the market growth differ for Enterprise verses SMB? This research will tell you. 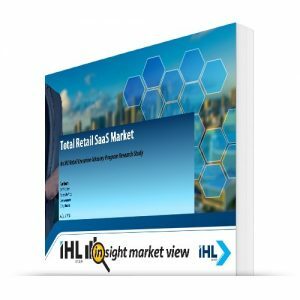 This research provides shipments and installed base on a quarterly and annual basis for vendors such as Square, Intuit, Shopify, Level Up, First Data, Paypal, Revel, NCR and Pay Anywhere at the SMB level, then Oracle, Infor, NCR, Aptos, Toshiba, and many others for use of mobile devices for POS. We look at shipments and installed base by segment and tier. Below in the Product Highlights section we get into the details of the data available. The Preview tab gives you some pictorial examples of the types of data available. This data is meant to be used in conjunction with the Mobile POS Study which provides the qualitative background of the trends. It is in this study where we discuss trends, barriers to entry, and growth assumptions. The data here is purely quantitative in nature. We are thankful to the vendors who participate in sharing data points to make this as accurate as possible. 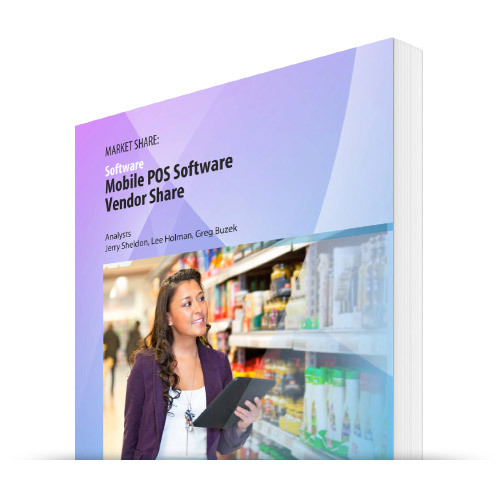 Initially this Mobile POS Software Share is focused only on the North American market. 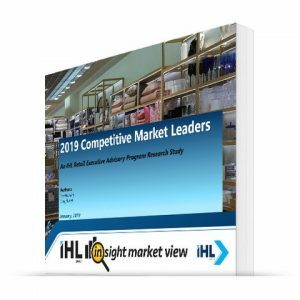 We provide this delineation on the market share as we realize the market at the smaller retailer level is quite a bit different than that at the enterprise level. The systems are different, the vendors are different, and the load on various systems are different. Below are some examples of some screen shots.We welcome you to contact us for a demo of the product so you can see the level of data and detail you would be provided. Click thumbnail to expand view. What do you define as Mobile POS? There are no doubt many mobile devices ranging from phones to phablets to tablets of all sizes. This specific service is for those devices being used by associates to process a transaction. 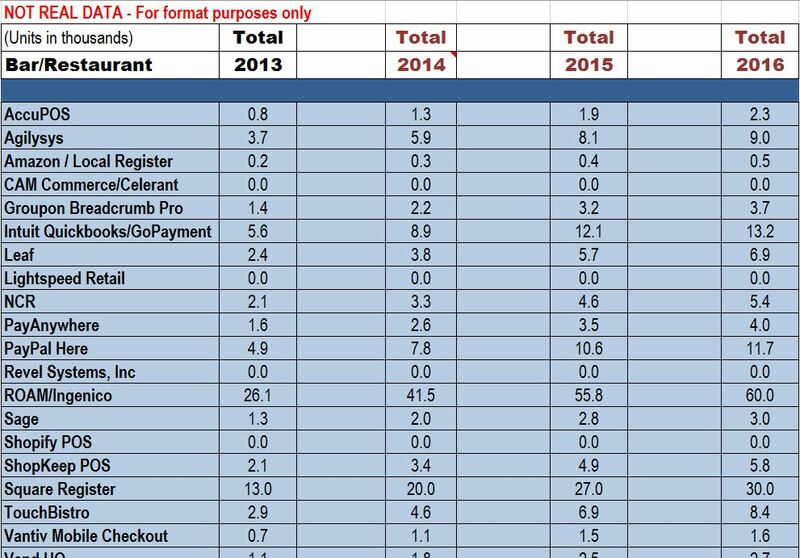 This can be with or without credit/debit readers. A consumer grade device or retail hardened. If it is purposed as a way to take transactions, we count it. To be clear, this is limited to the traditional retail segments as defined. We are not counting charities, repairmen, delivery men or garage sales where individuals add a dongle and swipe a credit card. But this is traditional retailers in this particular study. For non-traditional retail for transactions, or mobile device information beyond POS, contact us for more information. What retail market segments (verticals) do you address? For North America we further segment Specialty Stores into Specialty Category Killers and Specialty Other, and Hospitality into Fast Food, Bar/Restaurant, Lodging, Casinos/Cruises, and Entertainment: Theme Parks, Stadiums, Museums, others. How do you define SMB and Enterprise? There is quite a difference between Enterprise Mobile POS vendors and those that focus on SMB. And there are some that work in the middle. We needed to find a happy medium between the two. Since most of the volume is either small 1-2 store retailers and those above 100 stores, we used 50 stores as the cutoff. So this data and market share is broken out by those vendors concentrating on retailers with fewer than 50 stores and those above. So the likes of Square, Groupon, etc. would be considered vendors in the below 50 stores and then others like Oracle, Starmount, Toshiba, etc. would be listed in greater than 50. Can I buy just one segments or just the enterprise or just the SMB data? Yes, you can purchase as little as one segment. pricing begins at $1,500. This product has two primary price points. For the complete data by segment and totals with breakouts for large retailers and small retailers, the cost is $6,000. For one section (either Enterprise Data or SMB data), the cost is $4,000. You can also purchase specific segments starting at $1,500.